The Food Safety Modernization Act (FSMA) Final Rule for Sanitary Transportation for Human and Animal Food was released in late March 2016. 1) Enforcement for of the Sanitary Transportation requirements will begin 12 months from release of the Final Rule for large firms. This means enforcement will begin March 2017 for many large perishables handlers. Enforcement for smaller firms will begin March 2018. 3) Compliance will likely be considered satisfactory when subject firms can demonstrate they have developed and implemented systems which satisfy the requirements of FSMA. For example: Since FSMA mandates that all authorized individuals in the supply chain (shippers, carriers, Receivers) must remove suspected adulterated or abused products from the supply chain, can each participant demonstrate its system supports such action? Cargo Data recommends Lightning NFC as a vital element of your new FSMA compliance program. The Lightning NFC system is designed specifically to provide each participant in the cold chain with immediate temperature data review and automatically archives the data to the Cloud. Lightning NFC supports FSMA by making it easy to check cold chain integrity and to make informed decisions about product safety. Lightning NFC temperature recorders can be ordered online. Contact Cargo Data Corporation today to learn more about FSMA compliance and Lightning NFC at 800-338-8134 or information@cargodatacorp.com . 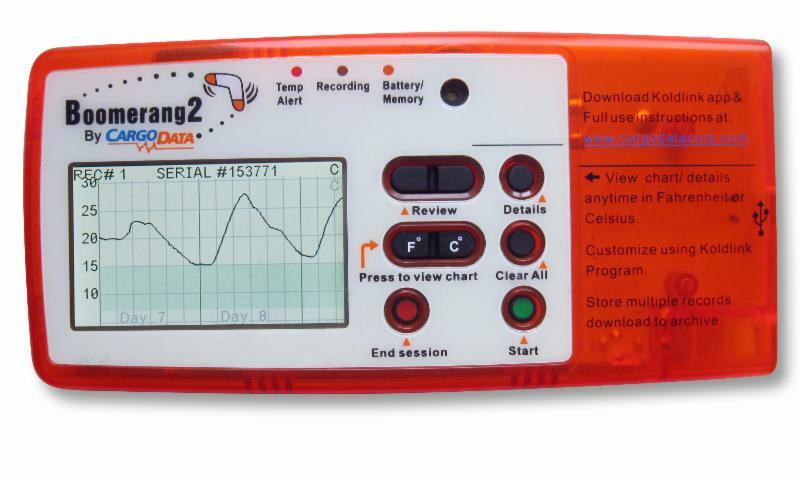 Boomerang2 supports use of external ambient air sensors and probes for monitoring internal product temperatures. Purchase sensors here, and probes here. • User replaceable battery (CR2450). Approx. battery life: 6 months. Ventura, CA- based Cargo Data Corp. has introduced its Quality USB temperature recorder. The small, digital device is designed to monitor perishable shipments, according to a news release. Quality USB features a LCD screen that shows temperature data without the need to connect to a computer. Featuring Cargo Data’s free KoldLink software, the new recorder permits allows users to view, print, archive and e-mail data directly from the program, as well as upload to the Cargo Data website. This removes the need for paper strip chart recorders, according to the release. Users with the recorder ID number can view, download and print temperature charts from the secure website. “Quality USB is small enough to place inside a carton and is provided in a food safe moisture-protective pouch to keep it clean and dry. This makes Quality USB the perfect recorder for iced, wet, and corrosive shipments,” Roger Niebolt, sales manager, said in the release.